We’ve been away for yet another week-long trip that challenged our clean bins. This time to the Kootenays of BC (an 8 hour drive East of Vancouver) to the fabulous Shambala music festival. Grant’s alter ego, Phontaine, was playing a dj set at the festival, so we decided to make a vacation of it, packed the car full of camping gear, turntables, and tupperwares, and headed out. The air pulsed with pounding bass from five stages pumping music 22 hours a day (there is a short break around noon – which was quite honestly not enough for me). We set up our tent among the 10,000 people already camping and braced ourselves for the piles of garbage and port-a-potty lineups we associate with most major music festivals. Refreshingly, none came. The loos were stocked with 100% recycled toilet paper, and bottle recycling bins abounded. Pizza came on a napkin instead of a plate, and there was free water from a central station, encouraging everyone to fill up their own bottles. There was not a styrofoam plate in sight. We could buy lovely wraps and ethnic meals that were placed in our containers with only a slight questioning look. But not all was green in the land of Shambala. I saw fried chicken in plastic buckets, couscous served with plastic forks, coffee steaming in paper cups, and at night, hundreds of disposable glow sticks emerged from the dark. 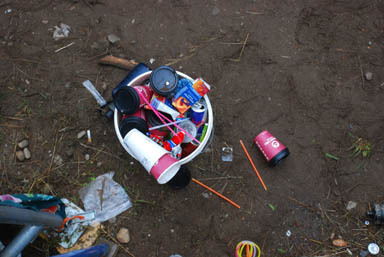 When we packed up, the piles of “good stuff” that appeared beside the garbage cans was sickening. Inflatable air mattresses, water canteens, tarps, collapsible chairs, and various other camping items that had been abandoned by their owners in favour of squishing another hitchhiker into the car. Nevertheless, personally we managed to stick (mostly) to the rules, accumulating a few paper napkins (compostable), a battery that got squished behind the seat, and a couple of drinking straws that we didn’t realize would be in a milkshake. We also received laminated ID cards as “talent” and “talent guest” and a plastic parking sticker, both of which seemed to be unavoidable. Our grocery shopping was less than spectacular, though all recyclable if you include soft plastics like cereal bags as recyclable. After a few lovely and relaxing days visiting friends in Nelson (one of the most eco-oriented towns I have ever known – they actually WANT you to bring your own container for bulk tofu at the deli), and with compost and recyclables in tow, we headed home. sounds like an interesting time. We notice all the challenges when we are away from home too. But it sounds like you were victorious and managed to only find yourselves with a small amount of stuff.